Which are the best days of your monthly cycle to take a test? Home > best week to... > Which are the best days of your monthly cycle to take a test? 24 Jun Which are the best days of your monthly cycle to take a test? I recently got an email from Hilary, a Hormonology fan who’s taking a licensing exam, and she wrote to ask which days of her cycle would be best to schedule it. If you are not bothered by test anxiety, take the exam in your Week 2. High estrogen will be making you think faster on your feet, sharpening your recall and boosting confidence. If, however, test anxiety is an issue for you, keep in mind that high estrogen in your Week 2 can intensify and prolong your body’s stress response. 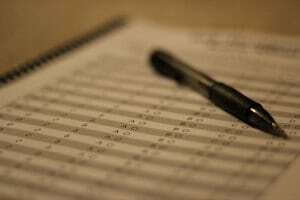 As a result, you might find yourself blanking out on answers you knew down pat when studying at home or feeling so overwhelmed, it impacts your test performance. If that’s the case with you, you can try to counter test anxiety with calming techniques prior to the exam, for instance, with yoga, chamomile tea, progressive muscle relaxation, meditation or slow breathing. However, if your test anxiety is too intense to be curbed with relaxation methods, then I recommend scheduling your test to fall during the second half of your Week 3 (4-8 days after ovulation). The combination of rising estrogen and progesterone on these days will help calm you while keeping your confidence up. I have to caution you, though, that rising progesterone in your Week 3 makes your brain sluggish and dampens recall. You can overcome these hormonal obstacles by studying more as well as pumping up mental energy prior to the test, say, by going for a brisk walk to get more blood flowing to your brain, which will rev alertness and thinking speed. Hope these cycle suggestions help you ace your next exam!